Article Oct 17, 2018 | by Charya Wickremasinghe, Ph.D.
Out of the enormous number of proteins in a cell (mammalian cells are estimated to have about 10 billion proteins per cell), being able to study even a handful has helped scientists decipher many biological mysteries. But many more remain to be solved, and with the growing demands of precision medicine, the field of single cell proteomics has had to mature and adapt quickly. Every day, researchers are tirelessly working to develop new methods and techniques that allow the comprehensive profiling of hundreds to thousands of proteins in individual cells, at an acceptable throughput. Thanks to these industrious efforts, our understanding of normal physiology, as well as how diseases can develop and progress, has advanced significantly. In this article, we take a closer look at how several scientists in North America are using single cell proteomics (SCP) technologies to discern disease pathogenesis and enhance directed stem-cell differentiation. In Assistant Professor Jia Guo’s lab, housed in the School of Molecular Sciences, Arizona State University, Tempe, AZ, USA, the main focus of research is to develop new genomics and proteomics technologies that can analyze a large number of different biomolecules in single cells of structured tissues. Through their work, Guo and his team mates are amassing valuable information on the complex molecular mechanisms of diseases like cancer and neurodegenerative diseases. The inherent complexity in biological systems comes from the many different types of structurally and functionally different cells that make up the systems.2 Such cellular heterogeneity is even more pronounced in disease states, especially cancer. To pick apart the differences between individual cells in complex multicellular organisms, we need to look at cells one-by-one. “Unlike bulk cell analysis, single cell analysis can reveal cell heterogeneity, spatial organization, gene expression regulation, and interactions of diverse cell types,” Guo explained. 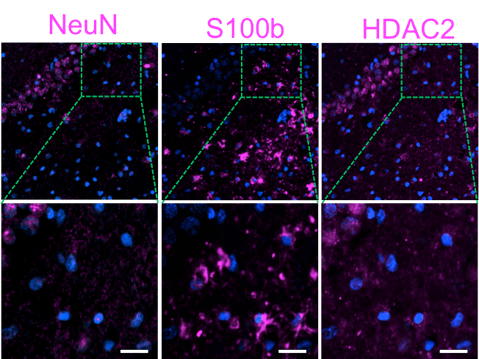 Guo’s lab uses antibody-based SCP technologies to study the human brain: Three proteins are sequentially stained with cleavable Cy5 labeled antibodies in brain tissues. Nuclei are stained with DAPI (blue). Scale bars, 50 μm. Because of their ability to self-renew and differentiate into multiple cell lineages, stem cells have long been the subject of rigorous study and much excitement in science and medicine. Being able to direct the differentiation of stem cells can help scientists tap into the vast potential these cells present for regenerative medicine. Current in vitro directed differentiation protocols rely on the valuable, but limited, knowledge we have on signaling pathways involved in the development of specific cells and tissues in vivo. While this knowledge – acquired over decades – has provided very useful guidelines, we have much more to learn, in order to understand the making of every cell type. “This gap in knowledge stems in part from difficulties in quantifying the signaling pathways in the single cells that make up the highly heterogeneous human tissues,” explained Nikolai Slavov, Assistant Professor at the Department of Bioengineering in Northeastern University, Boston, MA, USA. Why is it so important to look at individual cells? Because interpreting population-average protein levels is fundamentally confounded when samples consist of heterogeneous cells, clarified Slavov. The most obvious caveat is that the population-average may not be representative for any one cell type. But we can’t stop there. According to Guo, even ‘dozens of proteins’ are not enough. They only represent a small fraction of the whole proteome. Thus, the multiplexing capacity of the current technologies needs to be expanded. In addition, to quantitatively profile the low-expression proteins in clinically-archived tissues (such as formalin-fixed paraffin-embedded (FFPE) tissues), the detection sensitivity of the existing assays has to be significantly enhanced. Factoring in the time element, it would be desirable to further improve the sample throughput. Finally, Guo added that new image analysis algorithms should be developed for more precise cell segmentation and for studies of cell-cell communication. Agreeing with Guo, Slavov noted that his team is working on optimizing single-cell MS methods through efficient sample preparation in pure water5, experimental designs that allow multiplexing and enhanced peptide sequencing,4 and better computational strategies for the analysis of mass-spec data. In conclusion, he added that SCP can essentially expedite the development of regenerative therapies. “Many current approaches to developing directed differentiation rely on trial-and-error screens. This is where SCP becomes really useful. SCP technologies can systematically identify and prioritize screening efforts, and hence speed up the development process.” As Guo and Slavov both indicated in their final remarks, SCP no doubt holds great promise to unlock major mysteries in neuroscience, cancer, and stem cell biology. UPDATE: This article has been corrected to reflect the involvement of Dr. Bogdan Budnik's team at Harvard University in the development of the SCoPE-MS method. The paper which describes the method has been published in Genome Biology on Oct. 22, 2018. 1Muñoz, J.; Heck, A. J., Perspectives in stem cell proteomics. Genome Medicine 2009, 1 (4), 45. 2Mondal, M.; Liao, R.; Guo, J., Highly Multiplexed Single‐Cell Protein Analysis. Chemistry – A European Journal 2018, 24 (28), 7083-7091. 3Franks, A.; Airoldi, E.; Slavov, N. Post-transcriptional regulation across human tissues. PLoS Computational Biology 2017, 13(5). 4Budnik, B.; Levy, E.; Harmange, G.; Slavov, N., Mass-spectrometry of single mammalian cells quantifies proteome heterogeneity during cell differentiation. bioRxiv 2018 (preprint before peer-review). 5Specht, H.; Harmange, G.; Perlman, D. H.; Emmott, E.; Niziolek, Z.; Budnik, B.; Slavov, N., Automated sample preparation for high-throughput single-cell proteomics. bioRxiv 2018.